I hope everyone reading this has had as nice a Christmas as I did! I got some gorgeous new cookbooks to add to my collection so hopefully you’ll see some samples from these on the blog in the coming months. It has been a hectic time with plenty of (too much) food, drink and catching up with friends and family. 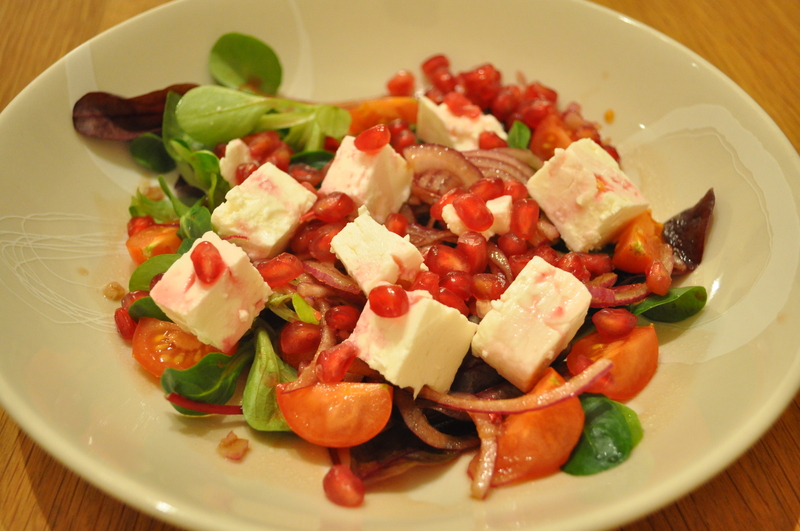 It’s time for something a bit lighter now and this salad works perfectly. It is adapted from Niamh Shields’ Comfort & Spice. I first made it with grilled halloumi as per the original recipe and then decided to make it for a special dinner. Unfortunately my local supermarket was out of halloumi. So I went for feta instead and it was just as tasty. This recipe uses pomegranate molasses which can be tricky to get hold of in shops. It is easily available online but I buy mine from Mr. Bells in the English Market in Cork. There are also instructions here on how to make your own. Make sure everything is at room temperature before you start. The quantities below make enough for 2 for a starter but you can double the amount if you want this as a main meal. Combine the pomegranate molasses and olive oil together. Add the red wine vinegar to taste, you may not need it all, it depends on the sweetness of the molasses. Season with the salt and pepper. Add the finely sliced onions to the dressing and mix well. I like to leave the onions steeped this way for about thirty minutes, it softens them slightly. It is not strictly necessary so if you don’t have the time use them straight away. Arrange your chosen leaves and tomatoes on to a plate. Place the onions and dressing on top and then the feta cheese. Sprinkle over the seeds of the pomegranate and any juice and serve immediately.